Many cancer treatments affect fertility temporarily or permanently. Fertility is the ability to become pregnant. Infertility is an inability to become pregnant or maintain a pregnancy. The ovaries store a woman’s eggs. Damage to these organs can decrease the ovarian reserve. The ovarian reserve is the total number of immature eggs in both ovaries. Women are born with all the eggs they will have. Once these eggs are lost, they cannot be replaced. Loss of healthy eggs causes infertility and early menopause. Consider meeting with a reproductive endocrinologist. This is a doctor who specializes in conditions affecting fertility. Some reproductive endocrinologists specialize in cancer-related fertility issues. Women with menstrual periods after cancer treatment may become pregnant. However, menstruation is not proof that you are fertile. In some women, cancer treatments stop menstrual periods. This is called early menopause. It causes permanent infertility. Other women’s menstrual periods stop during treatment but return later. Women who have periods after chemotherapy may still have lowered fertility. Even a woman who menstruates during treatment and remains fertile afterward might have lowered fertility or early-onset menopause. It generally takes longer for older women and those who had higher doses of radiation therapy or chemotherapy to start menstruating again. Also, menstrual cycles are less likely to restart after treatment in these women. Your health care provider can refer you for ovarian reserve testing. This is tested with sensitive hormonal tests, such as the anti-Müllerian hormone. Children and younger women have a larger ovarian reserve than older women. They’re less likely to experience immediate menopause and infertility after chemotherapy. However, this does not mean younger women won’t lose their fertility. With radiation therapy to the pelvis and lower abdomen and strong chemotherapy, even children can experience immediate menopause. For example, women taking hormonal treatments may need to delay pregnancy. Delay can further reduce fertility because women lose eggs through aging. If you experience delay, consider fertility-preserving options. Learn more about having a baby after cancer. 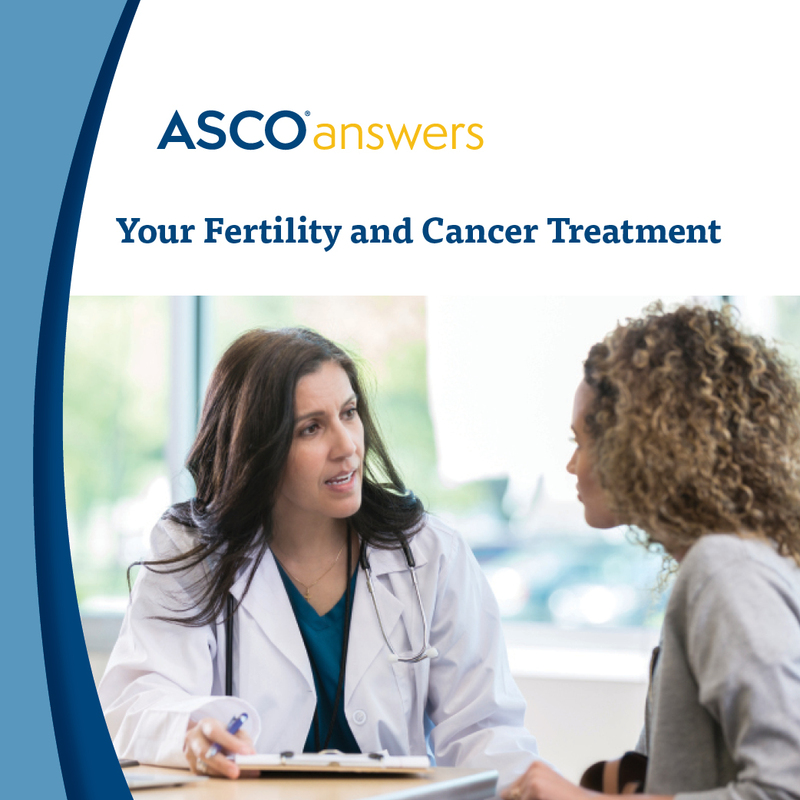 The American Society of Clinical Oncology (ASCO) recommends that all women with cancer discuss the risk of infertility and fertility preservation options with their doctors as soon as possible before cancer treatment begins. If you are interested in preserving fertility, you should ask for a referral to a reproductive specialist, even if you are unsure whether you want to have children in the future. Embryo freezing. This is the most successful method of fertility preservation. It’s also called in vitro fertilization. A woman takes fertility drugs for about 2 weeks. Then, a member of the health care team collects her eggs. These are fertilized by sperm in a laboratory. The resulting embryos are frozen until later. Oocyte (unfertilized egg) freezing. This procedure is similar to embryo freezing. However, the eggs are frozen without being fertilized by sperm. This is an option for women without a male partner. But it is slightly less successful than embryo freezing. Fertility-preserving surgery. Some types of cervical or ovarian surgery can preserve fertility. Surgery for cervical cancer: Sometimes, surgeons can remove the cervix while keeping the uterus. This allows a woman to deliver a baby by C-section. It’s an option for some women with early-stage cervical cancer. Surgery for ovarian cancer: Sometimes, surgeons can remove only 1 ovary. It’s an option for some women with early-stage cancer located in 1 ovary. This preserves the healthy ovary for reproduction and prevents early menopause. Radiation therapy that protects the ovaries. Some women may receive radiation to only 1 ovary. This preserves fertility. Another option is a procedure called an oophoropexy. A surgeon moves 1 or both ovaries where radiation won’t reach them. Then, the surgeon puts them back in place after treatment. However, this method isn’t always successful. Radiation isn’t precise and may still reach the ovaries or the ovarian blood supply. Ovarian suppression. This is an investigational approach to fertility preservation. It involves taking hormones that suppress ovarian function. This may protect eggs from treatment. Researchers have not yet demonstrated this strategy’s effectiveness. It’s generally not recommended over other standard fertility preservation options when those are available. Ovarian tissue preservation. This involves surgically removing and freezing ovarian tissue. Then, the surgeon transplants the tissue after cancer treatment. This may be the only option for young girls who cannot undergo oocyte or embryo freezing. For example, some girls may lack time or sexual maturity. Many pregnancies have occurred with this technique, and researchers are continuing to evaluate this option. What is the risk of infertility from the recommended treatments? Would potential infertility be temporary or permanent? Are there other effective treatments that do not pose as high a risk? Will these options postpone the start of my treatment? If so, what effect could this delay have on my chance of recovery? Will these fertility preservation options increase the risk that the cancer may come back? Should I talk with a fertility specialist or a reproductive endocrinologist? Where can I find help for talking with my partner about fertility? Several books are also available on this topic. Check your library or bookseller.